1 of 5 Bring large pot of salted water to a boil. 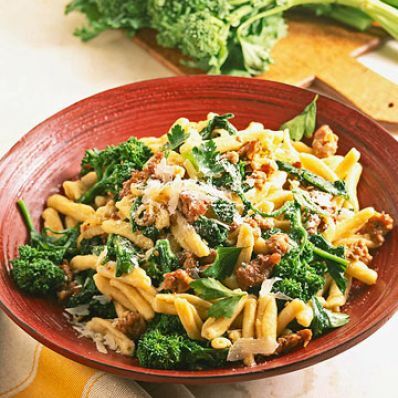 Add broccoli rabe; simmer 5 minutes. Using a skimmer, remove broccoli rabe and set aside. Return water to a boil. 2 of 5 Cook cavatelli following package directions. Drain. 3 of 5 Meanwhile, heat olive oil in large skillet over medium-high heat. Add sausage and onion; cook 5 minutes or until no longer pink, breaking up sausage with wooden spoon. Add garlic and cooked broccoli rabe; cook 5 minutes. 4 of 5 Add chicken broth, salt and pepper. Bring to a simmer. Add parsley. Remove from heat. 5 of 5 Pour sausage mixture over cooked pasta. Sprinkle with cheese. Serve.